This is your place to shop "The Park!" 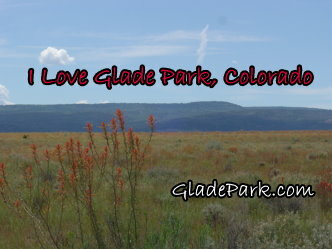 Find the perfect way to celebrate your love for Glade Park and Pinon Mesa. Or find a gift for someone who has treasured memories here. From teddie bears to T-shirts, to postcards, hoodies, and baby clothes, you will find the perfect gift or souvenir. Glade Park/Piñon Mesa is not just a region. It is a state of mind, especially for those who have lived, worked or played here. I have assembled a collection of books for those who are interested in reading about this specific region, as well as the Western Slope of Colorado. It is possible that all of these titles may not be available all the time, so check back if what you want is not here. If you have copies of these books lying around, and would like to let someone else have a chance to read them, you can sell them here also. COMING SOON: Also look for other fun and useful stuff that fits in with the activities and life style offered here. Let me know if you have suggestions. This book is a must for the lover of Piñon Mesa and Glade Park! And, YES, it is available online! You can find both unsigned and signed copies. Several links are provided so you can decide which copy you want. The book is out of print, so no new copies are available. "Footprints in the Trail" excerpt: "A Year on Piñon Mesa"
This is the story of a well known trapper named Leonard Slaugh. He trapped in Colorado between 1934 and 1959, and spent some time in this area. I remember him being mentioned when I was young. He stepped on the stage just after my uncle Monte Moorland stepped off of it. They both trapped during a time when predator control, rather than reintroduction, was the goal. Regardless of which side of that fence you are on, history is history, and should be looked at in the context of that time. This book is written by Slaugh's daughter. This is also the story of a Mormon family, so includes quite a bit of geneology. If you love geneology, you will enjoy those parts, especially if it dovetails with your own research. If geneology is not your thing, you may find yourself skimming over some parts. Mr. Vories has used this area, and its history, as a setting for some of his books. However he reminds the readers that his stories are fictional. The full name of this book is: “Early Days on the Western Slope of Colorado and Campfire Chats with Otto Mears the Pathfinder from 1870-1882.” It was first published in 1913. The author, Sidney Jocknick, came to this area at a time when it was going through a sweeping transition. He had the foresight to record his own personal experiences, and other events he knew of. These events include the story of the ill fated fellow travelers of Alfred Packer; life at the Ute agency and home of Chief Ouray; the Meeker Massacre; the story of Otto Mears (although not as chummy as an actual fireside chat); Ute history, and many Western Slope happenings. It is the Old Testament of Western Slope history. Of course the older editions are more valuable (and pricey), but the newer reprints by Western Reflections made this important work more available. Suggestions? Let me know here!